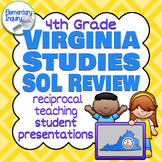 This comprehensive 98 slide PowerPoint presentation covers everything students need to know for the 4th grade Virginia Studies SOLs. It can be used as a teaching tool and for review before the SOL test. Lots of visuals! It has been updated to reflect the new VA Studies SOLs for 2010-2011. 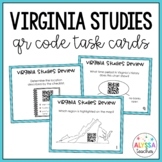 Virginia Studies SOL Review Program - All Units! 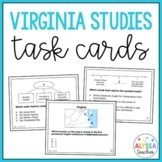 This packet includes a brief review of each Virginia Studies SOL topic. The review comes directly from the curriculum framework. Use it as a review each day during SOL review time, or as a packet for students to take home and use as a study guide. Covers Virginia Studies Standards VS.10b,c Virginia Studies SOL Review 26 by Lori A. Bland is licensed under a Creative Commons Attribution-NonCommercial-NoDerivs 3.0 United States License. Review sheet coverings VS.5 a and b. Great for classwork, homework, and review during 4th semester. Virginia Studies SOL Review 14 by Lori Bland is licensed under a Creative Commons Attribution-NonCommercial-NoDerivs 3.0 United States License. SOL review worksheet that covers Standards VS.1i and VS.2b. Works great as a warm up, homework or classwork during semester 4 SOL review. This work is licensed under a Creative Commons Attribution-NonCommercial-NoDerivs 3.0 United States License.